Fourth Row Center: Film Writings by Jason Bailey: On DVD: "Defiance"
Defiance is the kind of picture that Hollywood tends to trowel out every December as Oscar bait and pretend like they’ve been making all year long. It tells a noble true story in handsome autumnal tones; it lets its stars do some Acting with a capital A; and it concerns a little-known but inspiring story from our favorite movie war, WWII. Defiance didn’t do much at the box office (it was caught in a glut of Nazi-themed movies late in the year—every time its trailer ran, I thought I was about to see an ad for Valkyrie) and was all but ignored come February. Watching it now, it’s easy to see why it made so little noise. There’s nothing obviously wrong with it—on the surface, it’s well-constructed and competently directed and tells an important story. But it’s all surface. For such an emotional tale, it’s surprisingly passionless; the resulting product has a perfunctory, formulaic quality. The screenplay, by director Ed Zwick and Clayton Frohman, tells the true story of the Bielksi brothers, a quartet of Jewish farmers in Nazi-occupied Poland who created a forest refuge for other persecuted Jews. In the forest, they created a collective where all inhabitants worked, built, hunted, and protected the group; they learned to shoot and prepared to fight. Oldest brother Tuvia (Daniel Craig), stern and businesslike, becomes the practical and moral leader of the group; Craig’s work is straight-forward and no-nonsense, with flashes of soulful rage (though his character’s extended second-act sickness also cripples Craig’s ability to hold the story’s focus). Zus (Liev Schreiber, in a robust, fully felt performance) is less nuanced in his views—he wants full-throated revenge for the deaths of his family, and is less interested in Tuvia’s good intentions. Zwick and Frohman’s screenplay is frequently undercooked. Its opening scene shows the brothers discovering that the Nazis have murdered their parents; it plays all the right notes, but it’s tough to engage emotionally because we don’t yet know these men (we just know that their family is dead). Jamie Bell, as third brother Asael, is a bit of a cipher—his role is woefully underwritten, though it’s like Hamlet compared to the wafer-thin characters of the three brothers’ love interests. The script plods a bit from scene to scene and has difficulty pulling its threads through the narrative. However, Zwick’s sturdy direction occasionally covers the troubles in his script; some of his set pieces are involving and well-done. A late night killing spree sequence is blunt, brutal, and effective, while the brothers’ raid on a police station to steal necessary medicine is stylishly rendered. Eduardo Serra’s dreamy cinematography beautifully captures a winter wedding, while Zwick slyly undercuts the cheeriness of that scene by intercutting it with Zus and the Russian army in the midst of a particularly ruthless attack. The battle sequences towards the picture’s end are well-executed (we’d expect nothing less from the director of Glory and The Last Samurai), and a battlefield death scene is pat and expected, but still does the job. However, those flashes of ingenuity aren’t enough to put the film over. Like Zwick’s last effort, the vastly overrated Blood Diamond, Defiance is rather a paint-by-numbers affair. His direction is professional but strangely detached; in his attempt to tell the story without flourishes he’s drained it of the necessary emotion. As a result, the film is specious and lacking resonance; it looks good, and it goes through the paces, but it never really draws us in. 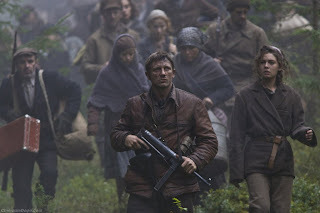 "Defiance" hits DVD and Blu-ray on Tuesday, June 2nd.